The plan was to walk 10 days on the Larapinta trail from Redbank Gorge to Standley Chasm (sections 12 to 4), cutting off three boring sections at the end. The distance would have been 171.6 km out of the 233.5 km total. An uncontrolled wildfire is burning in the western half of the West MacDonnell National Park, affecting sections 7, 8, 9, 10, 11 & 12 of the trail. 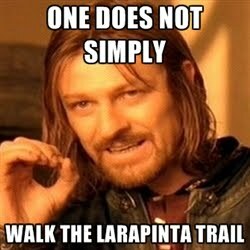 Walkers are advised that these sections of the Larapinta Trail are closed until further notice. The Redbank Gorge and Ormiston Gorge access roads are also closed. For further advice or enquiries, please call the Ormiston Gorge Ranger Station on 08 8956 7799. When I got to Alice the next day we found out, via Trek Larapinta who knew much more than the visitors information centre and the answering machine at the Ormiston ranger station, that the fires were out and Sonder (section 12) was open. We briefly toyed with the idea of going anyway, but decided against it. We were totally dependent on ranger-supplied watertanks, if one of those had been melted we would have been in big trouble, not to mention we were probably in for sucky walking through dirty burnt areas. So new plan: hire a 4WD and drive down to Watarrka (Kings Canyon) to do the Giles track overnight walk (22.4 km), camp at Redbank Gorge and climb Mt. Sonder (section 12, 15.8 km), come back to Alice for a rest day, then walk from Ellery Creek to Simpsons Gap (sections 6 to 2, 103 km) in 6 days.